Historic Finishes Analysis: Knowing where to look is sometimes half the battle. We were recently tasked with conducting an analysis of the historic interior finishes in a section of the North Office Building of the Pennsylvania State Capitol Complex. The Building was built and finished between 1928 and 1930, and based on the historic architectural design drawings, there should have been ornate spaces with decorative plaster and paint in the rooms where we were investigating. Above: A detail of the 1927 design drawing for the spaces of Suite 104 in the North Office Building on the PA Capitol Complex (Gehron & Ross Architects Sept. 07, 1927). The drawing above shows an ornate coffered plaster ceiling that is completely gone now. When we started the investigation of the spaces, we sampled the obvious and not so obvious places. We took samples from walls that included the current wall fabric but made sure to get the plaster beneath. We took samples high up in the room and down low. We made sure we got a couple samples from each wall of a room. We even crawled around, above the black iron and plaster drop ceilings (fitting through an access door in the ceiling that was literally only as wide as my shoulders and crawling in a space about 30 inches high), to find original decorative material. We could tell early on that the current wall covering was not original because there was a substantial build up of paint layers below it in some rooms, painted directly on the plaster walls. We thought that possibly the painted decoration could have originally been painted directly on the plaster walls, though buildings of this scale, and especially from our experience, in other buildings in PA's Capitol Complex, there should have been canvas on the larger sections of walls. Above: One of the executive offices in the space we investigated for historic c. 1930 finishes. That is NOT the orignal light fixture hanging from the c. 1950 drop ceiling. It is diffiicult to tell from this image but these walls were covered in a new textured painted fabric. Some of the wall samples, that were reviewed under microscopic analysis, showed evidence of an adhesive between the earliest paint layer and the plaster substrate, evidence that an earlier wall covereing had been removed, leaving only traces of adhesive. The image below is of a sample taken from the wall surface above the original chair rail. The walls above the chair rails did not originally have canvas on them. 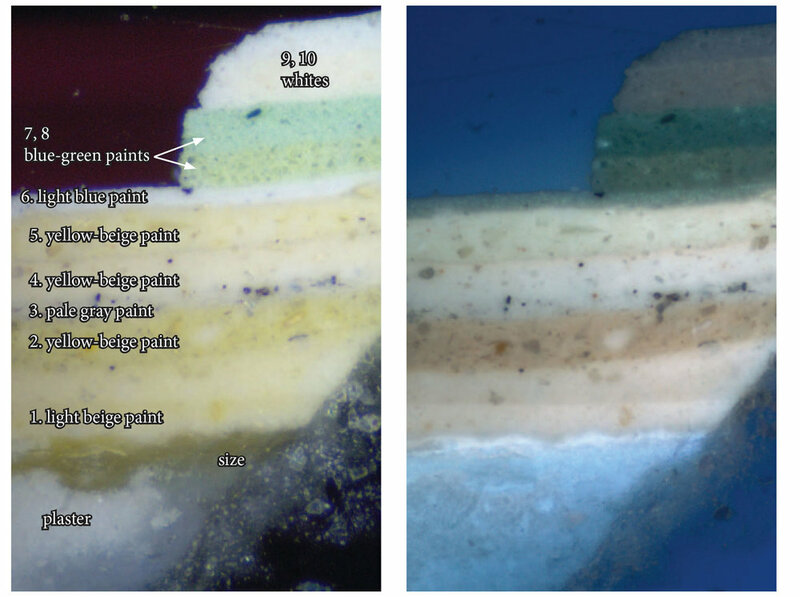 Above: Cross-section images, magnified 200X, of the orignal decorative finish (1. light beige paint) on plaster, under at least nine other paint layers. On the left is viewed under visible light and on the right under UV light (cross-section analysis and image by Kirsten Travers Moffit). We searched through historic written documentation in the PA State Archives and discovered what we had already surmised: that c. 1950, the spaces were scoured clean of most of the historic fabric and decorative plaster ceilings. The drop ceilings were added at this time to hide the air conditioning equipment. The original wall fabric was removed during this "upgrade", then re-painted directly on the plaster in some rooms, or new fabric was added in other rooms and it was painted. The c. 1950 demolition crew were pretty thorough when they removed the orignal material. We searched everywhere for any original wall fabric and found none, until the drop ceilngs came down. Once the c. 1950's drop ceilings were removed for asbestos abatement we were able to see and gain access to more areas of walls above those none original ceilings. We were able to look in the nooks and crannies above the drop ceilings that had essentially become time capsules for the orignal finishes and fabric and also of the evidence of the c. 1950 workers haste removing them. Remnants were left were it was more difficult and time consuing to remove them than it was worth. Above: A lone piece of forgotten canvas fragment stuck under a metal anchor that once held the picture rail. This fragment was found above the c. 1950 drop ceilings once they were removed. Small fragments of canvas were left, stuck under original picture rails and picture rail anchors, in some spaces that were inaccessible when the drop ceilings were in place. Other fragments were left in corners of the room where their orignal adhesive held them tight. It only really took one sample, though we reviewed all of the orignal canvas evidence found, to add that missing piece of the decorative puzzle. One sample had the known original, upper wall color, dripped over the original paint color on the canvas. Above: One small (2" x 2") c. 1928 canvas fragment, found behind a segment of original picture rail that had been hidden above a c. 1950 drop ceiling, contained the entire orignal color scheme (albeit under almost 90 years of dirt). When conducting historic finishes analysis it pays to not only think like a scientist, by conducting random sampling of all elements, but to also think like a decorator, targetting areas where decorative elements and/or original historic fabric should be. In a way it is our job to reverse-engineer the original decorator's or architect's way of thinking. In-painting locations of adhesive injection points. In-painting areas of wall mural damage.